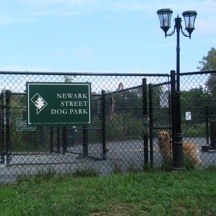 The Newark Street Dog Park is solely maintained and operated the Newark Street Park K9 Friends (a 501 c 3 organization) & survives by your donations to meet its$15,000 annual budgetary needs, which includes paying for dependable daily maintenance & opening for daily use. The City immediately pays for all repairs/replacements (e.g. water faucets/resurfacing/broken gate lock, broken waste cans;). The City currently provides for adequate lighting thus making it possible to use the dog park after dusk. Your ANNUAL membership fees & donations have paid for all emergency repairs (new water faucet, surface re-grading, and retrofitting drinking fountain. Any future modernization of gate locks, new solar lighting, and previous donations paid for benches, drinking fountain, and shade shelter. Your financial support is paramount in making this Dog Park a safe, clean, and enjoyable experience for you and your pet. The Newark Street Dog Park K9 Friends is self-sustaining and can function without the aid of volunteers. We look forward to your visit! Newark Street Dog Park, Washington, DC. Copyright 2012, Newark Street Park K-9 Friends. All rights reserved. Hang in there, Spring is coming soon (and with it our Spring fundraiser event). Last year it was a pizza party — this year ??? We need people to help plan and run this event. If you are interested, please send an email to info@newarkstreetdogpark.org and Agi Kiss (head of Events Committee) will contact you. Thanks! !